Any help on how I can avoid this failure in my next attempt at forging chisels will be greatly appreciated. The material I'm using is new 5160 1" round bar. 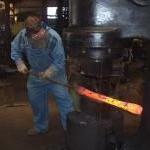 Using a gas forge with temp control, hammer and press for forging. After forging I did 2 normalizing / thermal cycles, first one at 1600, then one at 1550, soaked for 10 min each. I let them cool to the touch before the next cycle. Quench was done in 120 deg canola oil. 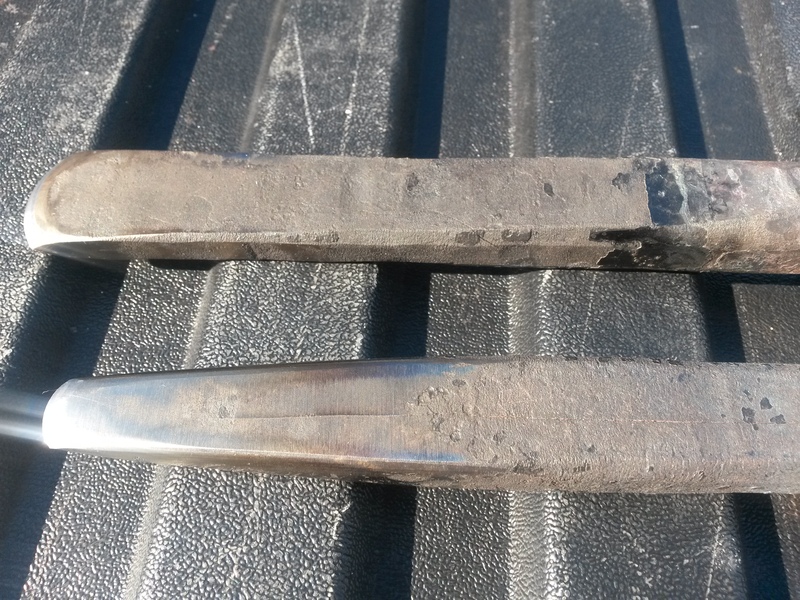 Both chisels show longitudinal cracks. Here you go - thanks. When using the press did the metal leave the press still glowing? It's possible there were a few small localized spots where the steel got cooler than I would have preferred while in the press. The dies were not preheated. I'd say low orange / high red heat on the last squeeze. Really only used the press to straighten. You're working it too cold. Thanks Fellas, I'll try again hotter next time. Will also preheat my dies. I have good luck working spring in the high orange to low yellow and go back to the fire when it cools into the mid high orange.